MARLEY TAYLOR: (As Stevie) I wish you were little. GREENE: "Little" is a comedy where a big and powerful executive wakes up as a little kid. From our Code Switch podcast, Shereen Marisol Meraji has more on the film's young star. SHEREEN MARISOL MERAJI, BYLINE: In the end credits for "Little," the screen reads, introducing Marsai Martin. MARSAI MARTIN: Yes, it does. MERAJI: So I thought it would be fun for you to introduce yourself to the NPR audience. M MARTIN: OK. Hello, everyone. My name is Marsai Martin. I am 14 years old - almost 15. And I'm also an actress, a executive producer and entrepreneur. MERAJI: Marsai may be new to the big screen, but she's not new to acting. She's been in the game for almost a decade. J MARTIN: ...Just so you know. MERAJI: That's Marsai's dad, Joshua Martin. He says the family was minding their business at a mall near their home in Texas when a woman handed them a coupon for glamour shots. Marsai was 5 at the time, and they signed her up to get her portrait taken. The photographer was so impressed with the way she took direction, he offered a bigger discount if her dad promised to show the photos to a few talent agencies. Here's Marsai again with her parents Joshua and Carol. M MARTIN: And we promised, and now we're here. J MARTIN: We kept our promise. J MARTIN: And this is what it did. J MARTIN: It was, like, four. C MARTIN: Yeah - submitted her pictures. And three of the four agencies said, we already have a girl who looks like that. Basically, we already have a little, black girl. Like, we don't need two little, black girls. We got - we have our one. MERAJI: Carol Martin says her daughter finally landed an interview at agency number four. 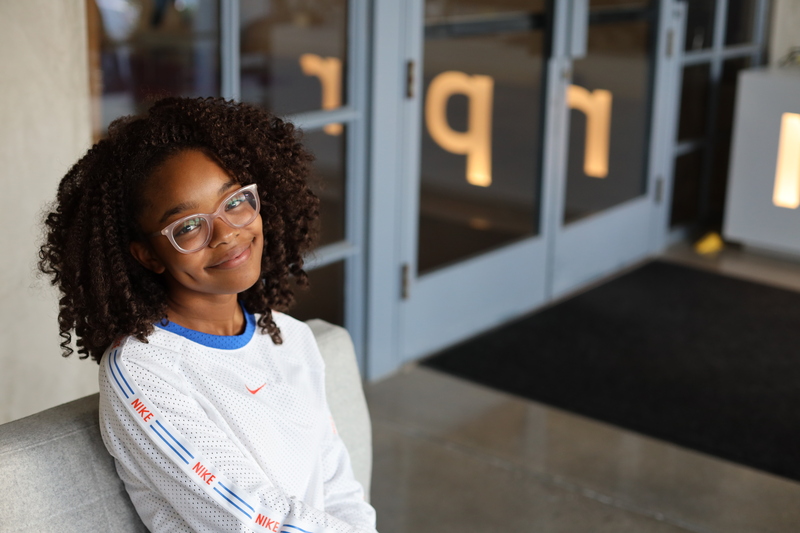 MERAJI: Marsai Martin's best known for her work on "Black-ish," ABC's sitcom about an upper-middle-class black family living in a mostly white neighborhood. It's loosely based on the show creator's life. KENYA BARRIS: I'm Kenya Barris. I'm the creator of "Black-ish." And from the moment we met her, it was this pint-sized, little ball of talent with these amazing glasses. MERAJI: Barris cast Marsai as one of the fraternal twins on the show, Diane. Her twin brother is Jack. M MARTIN: (As Diane) I'm tired of being Jack and Diane. Now I'm just ready to be and Diane. UNIDENTIFIED ACTOR: (As character) But you're a twin. M MARTIN: (As Diane) I didn't ask to be. MERAJI: Diane's wise beyond her years and can intimidate most adults with a withering glance over her trademark glasses. M MARTIN: (As Diane) Let me stop you right there. You're boring me. MERAJI: Barris says Marsai made Diane her own by Episode 2 and without very much formal acting training. He calls her an old soul. BARRIS: I do think that there is a person who's been here before that speaks through her. And I think that comes out in how she channels Diane and how she channels these characters that she becomes. MERAJI: The most recent character is Jordan from the comedy "Little," a tech mogul who magically reverts back to her nerdy 13-year-old self. In this scene, Jordan begs her assistant, played by Issa Rae, to take over for her at the office until she can figure out how to get back into her older body. ISSA RAE: (As April) I should probably dress the part and borrow some of your clothes. M MARTIN: (As Jordan) Your body can't fit into my clothes. This is squats. This is Pilates. RAE: (As April) That body looks like babyGap, Gymboree, OshKosh B'gosh to me (laughter). M MARTIN: (As Jordan, whispering) Oh, you get on my nerves. MERAJI: Marsai doesn't just play the lead. She pitched the idea. And if it sounds familiar, it's inspired by the 1988 film where a teenage boy magically becomes an adult. M MARTIN: My mom's favorite movie growing up was "Big" starring Tom Hanks. That was kind of when it started to get into my head and just saying to myself, like, what if we do this in, like, a modern perspective? And maybe - what if we do, like, a female empowerment, all-black-women cast? So I started talking about that with my parents. And then that's kind of how it got started. MERAJI: She ran the idea by her boss Kenya Barris when she was 10. BARRIS: She said, well, a lot of people tell me I kind of remind them of Gabrielle Union or Taraji P. Henson. Well, remember that movie "Big." I want to do a movie called "Little." And I was like, I'm going to stop you right there. No - nothing more needed to be said. MERAJI: Barris is one of the producers on "Little," which is being distributed by Universal Pictures. And this past February, Universal signed a first-look production deal with the company Marsai runs with her parents - Genius Productions. M MARTIN: Basically, all the ideas you come up with or anything that you have in mind for TV, film, any of that - in my case, you talk to Universal about it. And it goes to them first. MERAJI: Peter Cramer, the president of Universal Pictures, says he looks forward to moviegoers seeing Marsai in "Little" and, quote, "watching her evolve as a filmmaker." MIA MASK: Sorry to be a little cynical. I do think that it's a way to sell the film. MERAJI: Mia Mask is a film professor at Vassar College. MASK: And my current work is on African-American cinema. MERAJI: Mask really hopes Marsai looks to other women of color creators for mentorship and inspiration, specifically, Ava DuVernay, Kasi Lemmons, who directed "Eve's Bayou," and Dee Rees, whose screenplay for "Mudbound" was nominated for an Oscar. MASK: Because I'm concerned about what is going to happen after this film has been released and what comes next. I mean, we know that it can be difficult to maintain a certain high-profile standing and standard within the industry and that opportunities don't come along as often, as readily, as easily for women of color. It's a tough, tough industry. And I would encourage her to take heart and find solace and community in solidarity with other women of color. MERAJI: Marsai's mom Carol Martin says the family can already feel the difference between their daughter being on a sitcom versus a heavily marketed film. Her face is everywhere now. C MARTIN: The billboards are now on the sides of buildings. And it's amplified in a way that is new for all of us, so we are all kind of checking in on each other, like, are you good? Are you good? OK. She's done 18 interviews in a row. We - you know, sorry. C MARTIN: She's very hard on herself. C MARTIN: No, go ahead. M MARTIN: I feel like that's not just a kid thing. M MARTIN: Like, a lot of people kind of underestimate me because I am a kid. BARRIS: My boss (laughter). That's my boss. 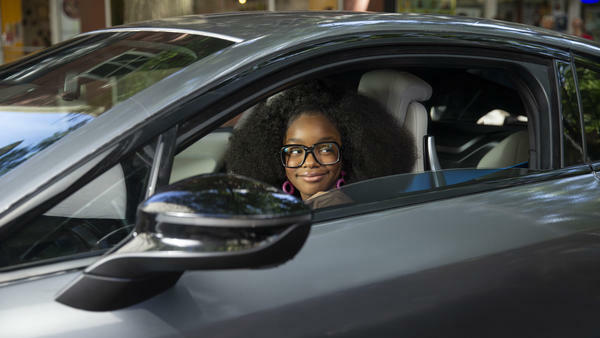 MERAJI: Until then, you can watch Marsai Martin playing the boss in the movie "Little," which opens Friday. Shereen Marisol Meraji, NPR News. (SOUNDBITE OF THE FOREIGN EXCHANGE'S "BE ALRIGHT (NICOLAY'S EASYBREEZY SUNDAY AFTERNOON REMIX)") Transcript provided by NPR, Copyright NPR.